This attractive tennis bracelet displays 5mm round cut gemstones in a polished prong setting that is perfect for evening wear and statement pieces. The bracelet is crafted of fine sterling silver and is nickel & tarnish free. It measures 7.25 inches and secures by box and tongue plus a safety latch. 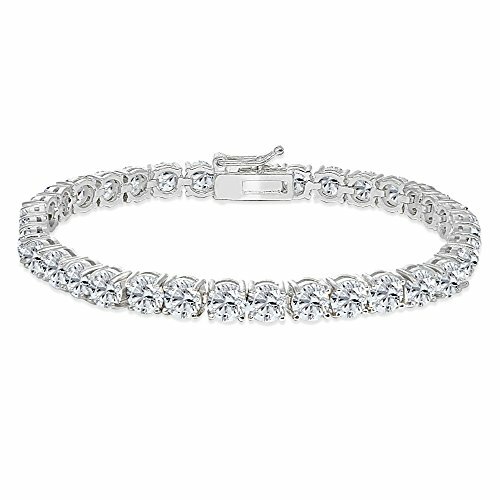 FEATURE - Wear this stylish bracelet to enhance your daytime and evening attire. This attractive tennis bracelet displays 5mm round cut created white sapphire gemstones in a polished prong setting that is perfect for evening wear and statement pieces. CRAFTED - The bracelet is crafted of fine sterling silver and is nickel & tarnish free. It measures 7.25 inches and secures by box and tongue plus a safety latch. This gem bracelet in fine jewelry is a great addition to your tennis bracelets and gemstone jewelry collections. It can be purchased as gifts for women, teens and girls. PACKAGING - Jewelry packaged with a nice box ready for gifting. If you have any questions about this product by GemStar USA, contact us by completing and submitting the form below. If you are looking for a specif part number, please include it with your message.